New York City will soon say hello to public phones with free high-speed Internet. This is part of a progressive program announced late last year called LinkNYC. In the coming months, existing public pay phones will be replaced by 7,500 digital telephone kiosks providing free voice calls and 24/7 free Wi-Fi. This digital deal will place unlimited Internet access within pedestrians’ reach, while putting infinite digital marketing opportunities directly at advertisers’ fingertips. MediaPost.com dialed in on more of the details. LinkNYC is backed by a team of technological titans, including Google co-founder Larry Page, Qualcomm, Comark, Titan, and Control Group. The new digital phones will be 10 feet tall and equipped with a microphone for making free voice calls, as well as attached Android tablets for free Wi-Fi service. Users will also have access to USB adapters for quick charging their digital devices, headphone jacks, and keyboards. The city is considering the addition of sensors that could detect temperature, humidity, noise, pollutants, ambient light, sun exposure, and street motion. Marketing experts will appreciate the kiosks’ oversized, responsive, digital out-of-home displays. This should make them attractive to advertisers because they will provide prominent placement of ad messages. It’s also important to the success of the program, which will be funded by advertising revenue. 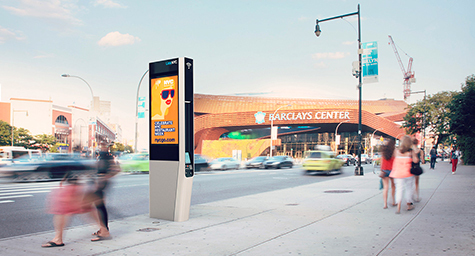 With these digital kiosks, marketers will have outstanding exposure to a world of New York City shoppers. It’s important that their marketing messages are designed to come across through the digital screens and command consumers’ attention. These kiosks will also allow for ad targeting by letting advertisers place their messages in specific parts of the city that are home to many of their customers. Learn the latest in digital marketing. Contact MDG Advertising. MDG Advertising, a full-service advertising agency with offices in Boca Raton and New York City, is one of Florida’s top branding firms. MDG’s core capabilities include print advertising, direct mail marketing, branding, logo design, creative, digital marketing, media planning and buying, radio and TV advertising, website design and development, online video advertising, mobile advertising, email marketing, content marketing, social media marketing, and SEO. To learn about the latest trends in advertising and branding, contact MDG Advertising.